Team XRat ransomware uses sophisticated techniques to infiltrate computers and hide from its victims. Use Reimage to determine whether your system is infected and prevent the loss of your files. Team XRat virus belongs to Xorist virus family, and these viruses fall into ransomware category. They are programmed to encrypt victim’s files on a computer that has been infected, and also on all drives that are plugged in the PC at the time of the infection. The Team XRat ransomware goes through the computer system and thoroughly scans it for particular file types, and then encrypts them with RSA-2048 encryption. After encrypting one file, the virus adds .C0rp0r@c@0Xr@ extension to the filename, hence a file that was previously named EXAMPLE.TXT becomes EXAMPLE.TXT.C0rp0r@c@0Xr@. However, the latest version of this ransomware dubbed Xpan virus appends .____xratteamLucked file extension to encrypted data. Once the ransomware finishes the encryption process, it creates and saves a text file on user’s desktop, changes desktop wallpaper with a picture showing people with Anonymous masks. Both text file, which is named Como descriptografar seus arquivos.txt, and the desktop background image contain a message that informs the victim about the encryption and that the only way to decrypt all data is to pay a ransom. The victim is asked to get in touch with criminals by sending an email to corporacaoxrat@protonmail.com or xRatTeam@mail2tor.com. Then the victim is promised to get instructions on how to pay the ransom and then receive a unique decryption key. The victim is supposed to enter the decryption key into decryption software (if the victim enters an incorrect key more than five times, the virus promises to destroy victim’s files). The ransom note also warns the victim not to use antivirus programs to remove Team XRat malware, as this supposedly would ruin encrypted data in an irreversible way. As we can see, the entire ransom note is written in the Portuguese language, which gives a hint that Portuguese computer users might be primary targets of this virus. Good news is that Team XRat decryption tool has been already released, and victims who have their files encrypted with the initial version of this ransomware can recover their data for free. The virus must be removed in a correct way, and for that, you need to use a professional malware removal software. We suggest using Reimage program for Team XRat removal. Sadly, victims of the newer version of the virus, known as Xpan ransomware, still have to be patient because the decryption tool hasn’t been released publicly yet. Methods used to spread this particular malware variant slightly differ from traditional ransomware distribution techniques. Besides traditional malware distribution techniques, such as malicious email campaigns and malware-laden advertisements, the authors of Team XRat virus use another and not so popular technique to reach target systems. The latest version of TeamXRat ransomware – Xpan can be installed manually only, and this can be done by using remote administration tools. 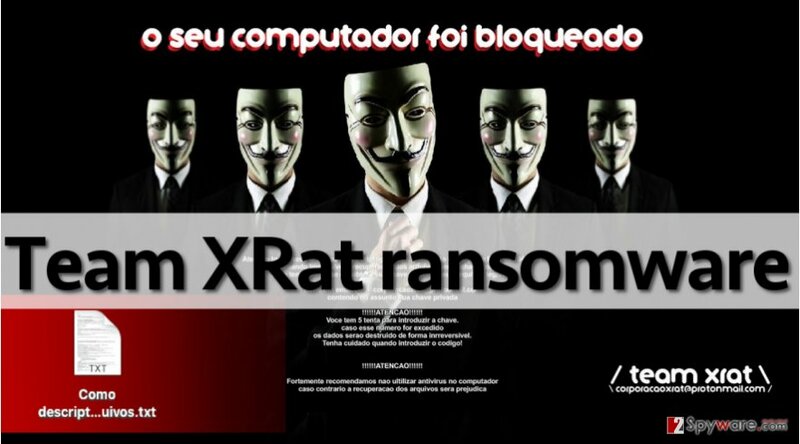 Reportedly, the TeamXRat ransomware is delivered by a ransomware gang known as CorporacaoXRat or TeamXRAT. This gang attacks computer that have Remote Desktop Services running on them, and tries to brute-force the login details to take control over the computer. After a successful attempt to encrypt data, the gang installs the Xpan ransomware and sets it to encrypt data stored on the compromised PC. Avoid carelessly clicking on ads on the Internet. Most of the time, cyber criminals send ransomware executive files via email, precisely concealed as safe-looking records. They typically write a basic message for the victim, inviting to open the attachment and see “important information” that it carries. Once the victim downloads and launches such file, ransomware gets executed immediately. You can also install this ransomware by clicking on bogus ads on insecure websites, typically the ones that aggressively demand to install software updates and similar pieces of software. In general, if you see that someone is actively trying to convince you download a particular file or install a certain program, step back. Chances are, someone is trying to make you install a malicious file! XPan ransomware. This is a recently discovered and modifed version of TeamXrat ransomware. It appends a different file extension to encrypted data – .____xratteamLucked or .___xratteamLucked. It also displays a different image on the computer screen and asks to contact xRatTam@mail2tor.com for data recovery instructions. The virus asks 1BTC in exchange for the decryption software. The primary targets of this virus are healthcare organizations and local companies. Considering that the virus leaves a ransom note that is written in the Portuguese language, we assume that it is created with an intention to attack Portuguese PC users. Before you start decrypting your files with Team XRat decryptor, remove Team XRat virus first. It is a must to remove the ransomware entirely before trying to recover corrupted files. It is highly recommended to reboot the computer into Safe Mode first, and then run the scan with the security software. Do not forget to update your malware removal tool before allowing it to scan your computer – this way its databases will be updated, and it will become capable of detecting all of the virus’ components and completing Team XRat removal successfully. Log in to your infected account and start the browser. Download Reimage or other legitimate anti-spyware program. Update it before a full system scan and remove malicious files that belong to your ransomware and complete Team XRat removal. When a new window shows up, click Next and select your restore point that is prior the infiltration of Team XRat. After doing that, click Next. Once you restore your system to a previous date, download and scan your computer with Reimage and make sure that Team XRat removal is performed successfully. Guide which is presented above is supposed to help you remove Team XRat from your computer. To recover your encrypted files, we recommend using a detailed guide prepared by 2-spyware.com security experts. If your files have been attacked by the newer version of Team XRat virus, known as Xpan ransomware, then you can try this tool to restore them – Data Recovery Pro. Instructions on how to use it are given below. Malware researchers have managed to crack this malicious virus and find an antidote for it. Therefore, victims who have their data encrypted by this virus can now recover all files for free. This Team Xrat decryption tool works for victims who find .C0rp0r@c@0Xr@ extensions added to files. Sadly, victims who have their data encrypted by XPan version have to stay patient and wait until its decryption tool is publicly released. Meanwhile, victims can try alternative data recovery options. This entry was posted on 2016-09-30 at 01:19 and is filed under Ransomware, Viruses. You can quickly scan the QR code with your mobile device and have Team XRat ransomware virus manual removal instructions right in your pocket. How did you remove Team XRat virus?